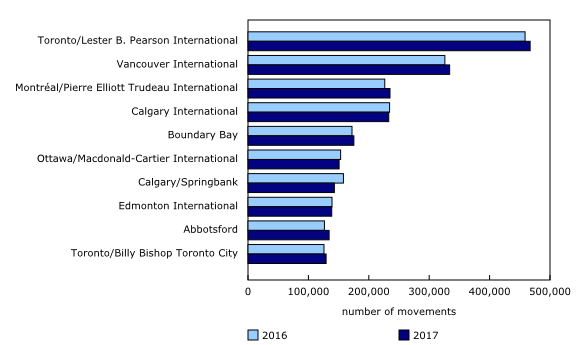 Aircraft take-offs and landings at the 91 Canadian airports with NAV CANADA air traffic control towers and flight service stations totalled 5.6 million movements in 2017, an increase of 1.7% compared with 2016. 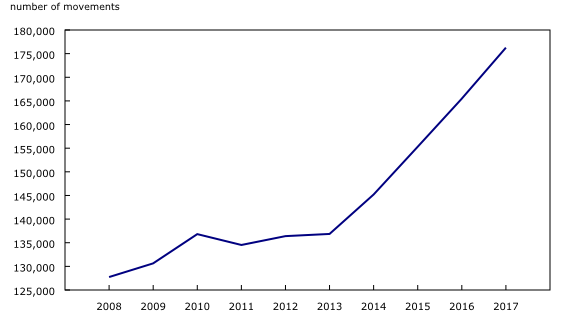 There were 3.4 million domestic itinerant movements (within Canada) reported at 91 Canadian airports in 2017, an increase of 2.1% (+68,528 movements) from 2016. In August, British Columbia declared 2017 to be the worst wildfire season since record keeping began in 1950. As a result of fire suppression activities in the area, domestic itinerant aircraft movements at the Williams Lake Airport showed a notable increase throughout the summer. Annual domestic itinerant aircraft movements at this location increased 89% to reach 15,557. 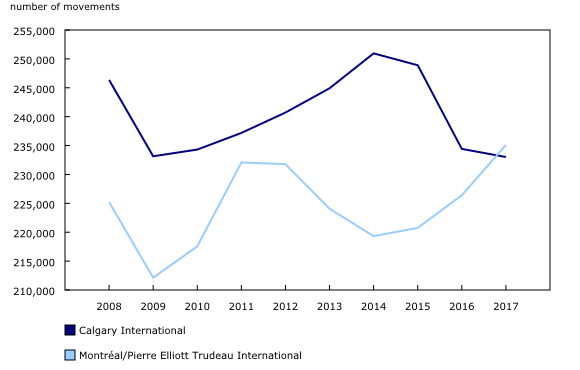 In 2017, 91 airports reported 481,618 transborder itinerant movements (between Canada and the United States), virtually unchanged from the previous year. Overall, transborder itinerant movements declined in each of the four previous years. In 2017, 66 airports reported 176,266 other international itinerant movements, up 6.5% (+10,778 movements) from 2016. The gain was led by growth (+4,510) at Vancouver International. Data for 2013 to 2017 have been revised. Additional analytical information is now available in "Annual Aircraft Movements: Major airports – NAVCANADA Towers and Flight Service Stations, 2017," as part of the service bulletin Aviation (Catalogue number51-004-X).